Sprint and Nextel formed an official relationship, but you can still buy Nextel cell phones that are branded as such. However, there are no standalone Nextel stores as the service has largely been integrated with the Sprint network. Nextel cell phones are typically designed with the rugged business user in mind, with the most prominent feature on their handsets being Push-To-Talk, or "walkie-talkie" like functionality over their cellular network. For more on Nextel cellular service, check out our article on Nextel plans. December 15, 2004: Merger announced with Sprint; new company to be dubbed Sprint Nextel Corporation. Sprint Corporation would purchase Nextel Communications for $35 billion. July 13, 2005: Shareholders overwhelmingly approve the merger, which would result in combined resources and profits. August 3, 2005: The US Department of Justice and the FCC (Federal Communications Commission) -- a governing body that is responsible for approval of new cell phones for use in the United States, among other responsibilities -- give the merger the go-ahead, on the condition that Sprint Nextel continue to offer service on the 2.5GHz band for the next four years. August 12, 2005: Deal is completed, formalized, and Sprint-Nextel is born. Following the merger, customers from both sides were offered the choice to convert their plans from Sprint to Nextel, and vice versa. Subscribers would need to change their handsets to the new "company", and as such, Sprint Nextel offered rebates of up to $40 to buy back old cell phones. While Sprint-Nextel is officially headquartered in Reston, Virginia, the company's operational and engineering offices can be found in Overland Park, Kansas. One of Nextel's unique features is their ability to offer push to talk (PTT) on their mobile handsets. This mimics the use of close-range walkie-talkies (or, as some put it, "the half duplex operation of a two-way radio"), helping business groups stay in touch with one another. You may have noticed the walkie-talkie like functionality of some cell phones used over the course of The Apprentice television series on NBC, where participants could simply press and hold a single button the outside of the phone and immediately broadcast a voice message to several members of his or her team. 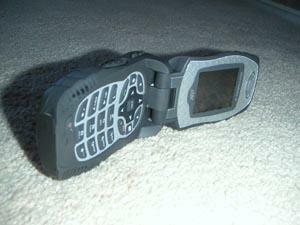 Nextel operates under the iDEN protocol, a technology developed by Motorola. It is based on TDMA (time division multiple access), which can be said as being similar to CDMA (on which Verizon and Telus Mobility operate), as opposed to GSM-based technologies, as deployed by T-Mobile and Rogers Wireless. As a large part of Nextel's business operates on iDEN technology, a good proportion of the mobile operator's line-up consists of Motorola Cell Phones. Many of their handsets are designed to withstand the elements, featuring military-grade resistances to water, dust, and shock. Finding rubberized grips, beefy antennas, and fairly thick form factors is nothing out of the ordinary. Motorola Clutch i465: Offering users a full QWERTY keyboard for ease of email and text messaging, the Clutch is just as rugged as its smaller counterparts. There's web browsing, GPS, Group Connect, and Nextel Direct Connect found within. Motorola Debut i856: Unlike most other iDEN phones from Motorola, the Debut does not appear to be nearly as rugged in appearance or nature. In fact, it looks like a conventional mobile phone in many respects while retaining the popular Nextel Direct Connect Push-to-Talk capability. It'll send emails and navigate with GPS as well. BlackBerry Curve 8350i: Available with or without a camera for corporate security reasons, the Curve 8350i is the only BlackBerry available with Nextel Direct Connect service. As expected, it comes with all the BlackBerry functions, as well as Group Connect, GPS, and more.